"At Coolhaus, we love all types of food and strive to push the boundaries of traditional dessert by creating unique, sweet-meets-savory flavors you can’t find anywhere else. We sit down for a meal and think, “Shucks, wouldn’t that make a good ice cream sandwich combo?” (True story: pickled ginger radish and wasabi at a sushi dinner became an ice cream sandwich with ginger cookies and chocolate wasabi ice cream.) Our adventurous palates have led us to create pint flavors, like Milkshake & Fries, Balsamic Fig & Mascarpone and Street Cart Churro Dough, that consistently shake up the freezer aisle. Equally important to our dedication to innovation is our commitment to quality. All Coolhaus ice cream is made at a 20% overrun making it one of the creamiest, most delicious ice creams on the market. Each treat is handcrafted with hormone free, real California milk, cage free eggs, fairtrade chocolate and the freshest, most unique ingredients available, meaning some flavors and ingredients are seasonal to promote peak flavor and responsible sourcing. Coolhaus is also a certified woman-owned business." 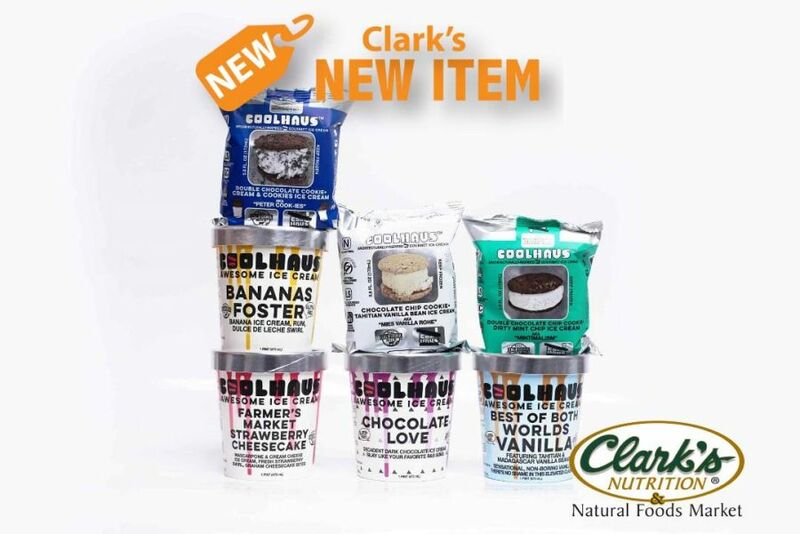 Now available in select flavor varieties at Clark's stores.